Going further west than I had ever done before, I was expecting to see and meet more of those that I originally met heading The Alternative Way, as I have dubbed it. This would mean finding those who were more caught up with the legends of King Arthur, Avalon and old mystical places – rather than anything to do with prayers, religious dogma and revelations – and like one of the sets of characters that I first met back in Winchester in 1991. My expectations were based on snippets I had read about those claiming some part or hold over the old Dark Age legends of Britain, with the Welsh – those furthest West – being amongst those with perhaps the closest, if not strongest, claim to perhaps the best known of these: that Merlin, the spiritual advisor to King Arthur, was one of their people (or, rather, a spiritual leader from one of the native tribes who lived in that area back then). There’s also the claim that some of the stones used in Stonehenge come from the Preseli Mountains there, and that Merlin is supposed to have somehow used his powers to help transport them to its site in Salisbury Plain. The Irish also claim Merlin too – but, either way, it seems to be accepted that he was a Celtic character possibly involved in spiritual proceedings around that time and some form of druid or magician. The thing is, it’s only been snippets like that that I have found out about the Welsh and Irish connections – and perhaps because both Welsh and Irish are Celtic languages that were only spoken and not written at that time? Who knows – but I was hoping I might find something that might at least relate to those early times and experiences, without necessarily having to learn the language. To start with, I must admit, I took it easy on following this trail and enjoyed the great sunny weather that we were very fortunate to have in that Royal Wedding week – and especially where we went to in that little corner of Pembrokeshire in Wales that sits conveniently at the end of the M4, along with its load of great well-preserved Roman and medieval walled towns to explore (as well as great beaches and countryside, of course!). Ironically, this looked to fit more with The Pilgrim’s Way – which I was used to seeing signs and places to visit back on the East side of the M4, and especially from Winchester in the South to Canterbury in the East. No one had told me about the pilgrims’ trail in this part of the country before – and, perhaps naively, I had just presumed that everyone in the Dark Ages and medieval times went east to find their will or their way or whatever it is that a pilgrim seeks. Of course, I should have realised that back then the kingdom was not united as it is now – and so the Celtic people of the West side needed their own set of saints and succour, as much as those did in the East. Sadly the actual site showed no sign of the chapel, nor even burial ground, that once stood at this place. There was a path next to the sign that led off into the hills, but I could not see any trace of plots and buildings. So who or what were those pilgrims seeking, so far from anywhere there? 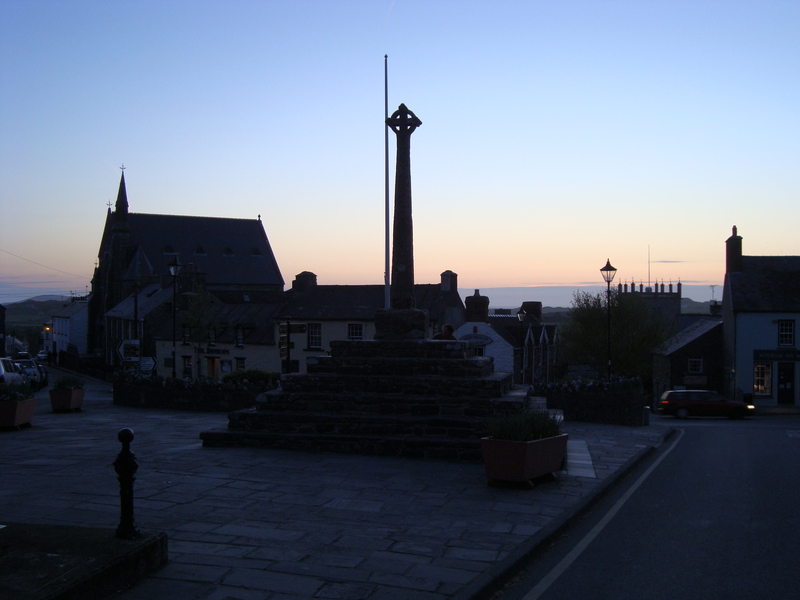 It was not until I came to another town called St. David’s that I got any clue or inkling about who these pilgrims might have been seeking. The clue was in the name of the little city and the consequences of how it came to have a cathedral. 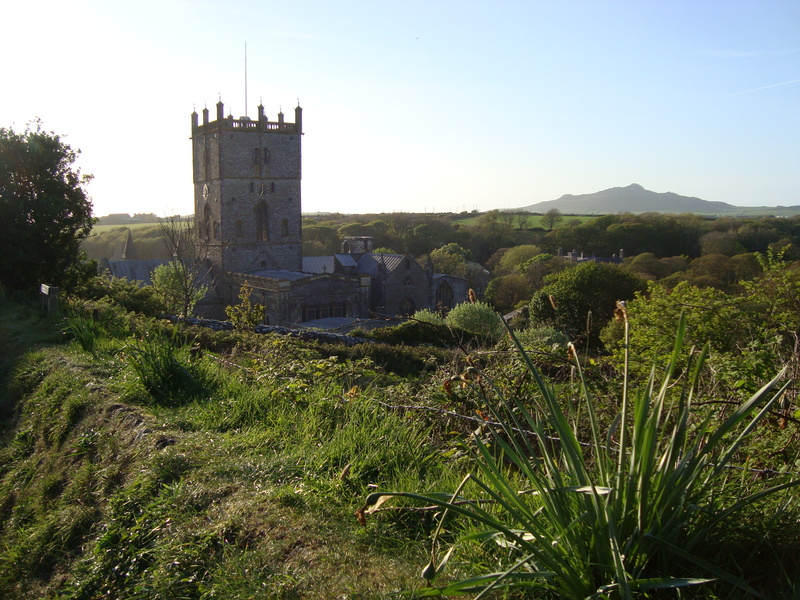 St. David’s is, in fact, the UK’s smallest city – having been granted that status by Queen Elizabeth II on account of its cathedral. Yet there is more to it than that, as I discovered. St. David was one of the first and officially recognised Celtic saints, as well as being the patron saint of Wales. An interesting fact is that he was “born out of violence” to the daughter of a king by the King of Ceredigion. His unfortunate mother, Non, ended up her days in a Breton convent and notably achieved sainthood herself. He lived in the fifth to sixth century AD. The timing of this seems to tie in quite well with Arthurian legends of the time. Indeed, St. David was reputed to have visited Glastonbury around the time that King Arthur was reputed to have lived – so perhaps they could even have met or he could have written a sermon, story or letter about him or “the great encampment of Camelot” if it existed then and there? Indeed, his mother may well have known Lancelot and his mother, Vyvyanne and the du Lac family – as they originated from Brittany. Certainly the contemporary parallels are interesting, if not intriguing. 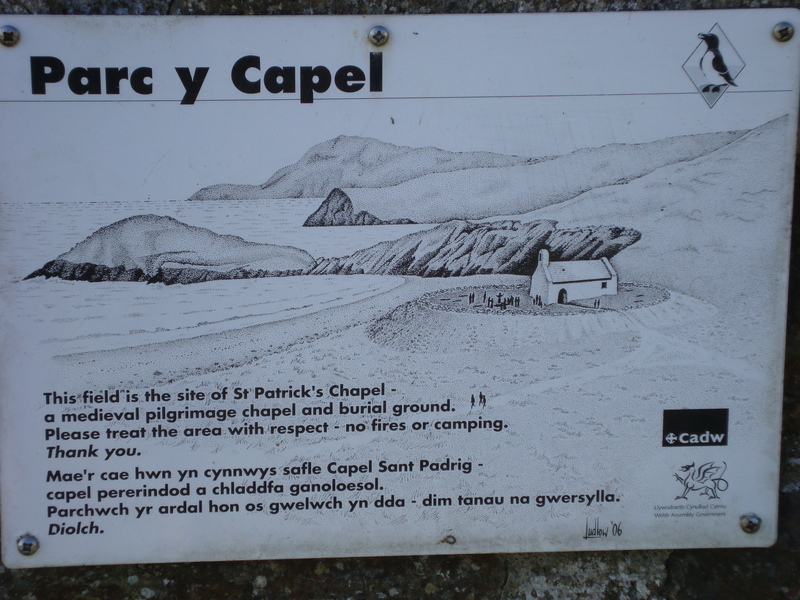 Unfortunately none of this explains the sign I saw down at Whitesands beach, however I am simply surmising that site on the pilgrims’ trail there ends up at St. David’s – but with nothing to tell me why, as yet. Certainly there is nothing to connect this at all with The Pilgrims’ Way in the East – and so it seems like some potential for lots of lost pilgrims in this part of the UK [ and maybe that’s where the expression “Go west” has come from – perhaps even tied in with going that far to see where the sun goes after it sets – but it is not clear from some of the links I’ve found on that ]. Still, who were the pilgrims back then and what were THEY seeking, by contrast with their Anglo-Saxon Christian counterparts in the East. Certainly the crosses are Celtic by contrast (and I will blog more on why that may be significant later). 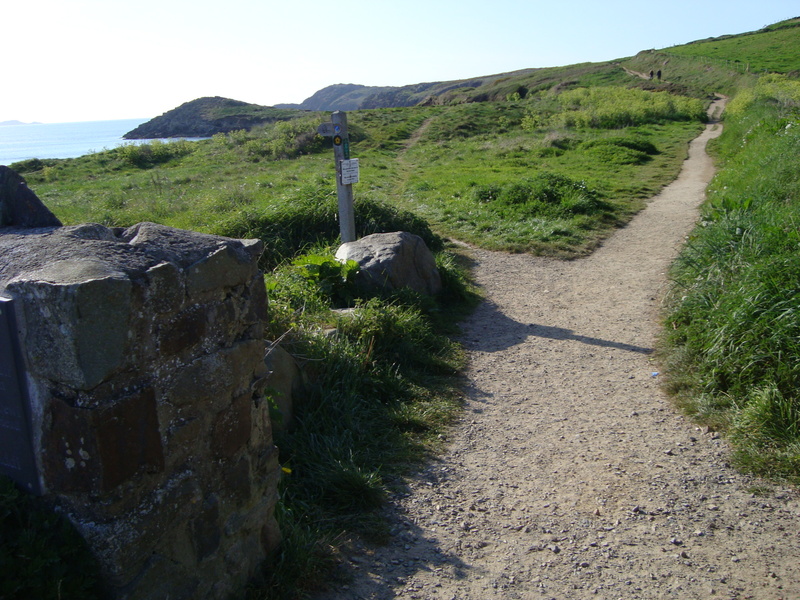 For now, it seems that Wales has losts its pilgrims and its pilgrim’s trail – perhaps to the wise men of the East – but maybe there’s simply more research in following up on whether this is the case and why, as well as blogging on’t. This entry was posted in Pembrokeshire, Pilgrimages, St. David's, Whitesands, Winchester and tagged Merlin, pilgrims. Bookmark the permalink. love it Matt. the tale gets more and more interesting. you should be a sleuth, you certainly have a way of digging out interesting facts. I was thinking how much fun it would be if we managed to get a group together based on Chaucer’s known characters and set off for Canterbury! I have a tent and a sleeping bag now 🙂 and I have discovered that I can sleep on the ground without too much ill-effect. Anyhow, Cindy, methinks you already understand a lot of that and are on to my cunning plan to see if we can recreate some of the spirit of Chaucer in retravelling the truly road less travelled to Canterbury – but, forget the tent and sleeping bag as well as sleeping on the ground, as the only chills and spills we would need to worry about would be ones from sleeping in dam and possibly spooky old taverns or coaching houses where the spirits of those lost fourteenth century pilgrims, whose tales did not get mentioned in Chaucer’s Tales (such as The Gardener), might take hold in channelling their missing tales through one or other of us whose spirit is true and close to theirs in the present day. Equally, I look forward to your next travels and discoveries – perhaps writing up about those bones you found beneath the water line of The Thames?? Scarey but troo too, lassie!! !